The city approved a proposal Wednesday that will force P.S. 9, an up-and-coming elementary in Prospect Heights, to share its building with a charter middle school -- despite emotional protests from P.S. 9 supporters and an alternative plan to expand that school to grade eight. The charter, Brooklyn East Collegiate, will move into the building next year, while the low-performing middle school that currently fills the space, M.S. 571, begins a three-year phase-out. At a public hearing at P.S. 9 on May 13, P.S. 9 supporters -- including parents, students and elected officials -- railed against the co-location plan. 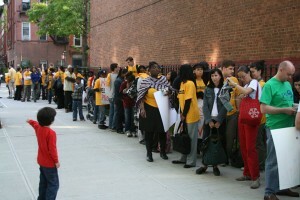 Brooklyn East Collegiate proponents said the plan was fair and gave local parents more choices. Though the city's plan passed, its outcome is still uncertain. On the same day the city's Panel for Educational Policy approved the P.S. co-location plan, the United Federation of Teachers and the N.A.A.C.P. filed a lawsuit against the city to halt its school phase-outs and co-locations. The legal proceedings could delay or even stop the P.S. 9 plan. Find a timeline of the P.S. 9-Brooklyn East saga below. Also check out our coverage of last week's heated hearing. Our photos and blog updates capture some of the emotions that flew through the school auditorium during the four-and-a-half-hour event -- emotions that will continue to reverberate as this story unfolds. The Bumpy Road Toward Co-Location in Brooklyn on Dipity. 10:10 After more than 100 speakers - many of whom were absent when their name was called toward the end - the public comment section concludes and goes to answer section with the Department of Education. We're going to take that cue as our time to leave as well. We hope you enjoyed our coverage and we look forward to doing some more in the future. 10:01 A P.S. 9 parent came loaded with 2010 census research and since this site is all about Changing NYC, we couldn't pass up sharing it. In Prospect Heights, she said, people under the age of 17 grew by 25 percent. By 2015? That figure is estimate to grow by another 30 percent. WIth that in mind, she said, school building space will be at a premium. 9:53 - The moderator just flew from speaker No. 75 all the way up to the speaker No. 95. Lots of people spoke - and even more signed up - but it looks as though many who signed up too late passed on staying this late. 8:00We're moving our live blog updates to the chat stream. Check above! 7:35Parents from P.S. 9 are voicing their opposition to the DOE's co-location proposal. One P.S. 9 father said: "It’s about packing my daughter into gym like sardines." A woman supporting P.S. ended her comments by addressing the group from Brooklyn East: "If your students can’t get into the school next year, you’re welcome to come here." 7:10Letitia James, Councilwoman from District 35, which includes Prospect Heights: "I continue to be in support of the expansion of PS 9." "Pitting one set of parents against another is not education." "What I say to the DOE is: Give them an option to grow." "You are trying to take a square peg and put it in a round hole and it just doesn’t fit." Assemblyman Hakeem Jeffries, Assembly District 57: "I'm here to strongly oppose to proposal to put Brooklyn East into the PS 9 building." "It’s shameful that the DOE would choose to use such divide and conquer techniques." 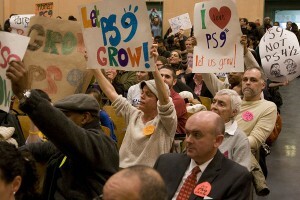 "PS 9 represents all that is good in NYC. You have white children and black children and Jewish children and Muslim children and Christian children." "I’m pleased to join with Letitia James as the plaintiff to block any decision that does not allow PS 9 to expand. We’re going all the way with you." Khem Irby, from the District 13 Community Education Council: "We want to build the schools from within our communities. We don’t want the DOE to build what they deem as quality choices." Eric Green, Brooklyn East Collegiate's principal: "In a short time we have built an incredibly successful school." "The fact that some families would not choose [to send their children to a charter school] does not mean that no family should have that option." "We look forward to working together to be a model for co-location across the city." 6:25A DOE spokesperson began with: "We’re here to be activists, not adversaries." Next, Eric Green, Brooklyn East's principal introduced himself, and was greeted with applause by Brooklyn East supporters. Green said: "It’s my sincere hope that we can remain positive and respectful throughout the hearing." Then Sandra D'Avilar, principal of P.S. 9, introduced herself. P.S. 9 supporters responded with a few minutes of raucous applause. D'Avilar concluded her remarks with: "Try to conduct yourselves with dignity, because our children are reason enough." 6:15The meeting is about to start. The hearing will revolve around a proposal by the DOE to co-locate Brooklyn East Collegiate, a charter middle school, inside the same building as P.S. 9, a traditional elementary in Prospect Heights. P.S. 9 currently shares a building with M.S. 571, a traditional middle school. But this February, the city decided to close the struggling school. M.S. 571 will phase-out over three years, until it closes for good on June 30, 2013. This April P.S. 9 sent a letter of intent to the DOE asking to let it expand into a K-8 school, rather than move Brooklyn East into its building. The hearing tonight will consider the different proposals by the DOE and P.S. 9. 6:00More people are pouring into P.S. 9's auditorium. Brooklyn East Collegiate supporters have taken over the left side of the room, while P.S. 9 supporter have claimed the right side. Members from both groups are sharing the middle. 5:55 p.m. The hearing at P.S. 9 is set to begin in a few minutes. The Department of Education (DOE) will speak first, for about 45 minutes. The public comment section should begin around 6:45 p.m.
Parents, students, teachers and others began to form a line outside the school well 6. Supporters of Brooklyn East Collegiate, the charter school the DOE has proposed co-locating with P.S. 9 and M.S. 571, are wearing bright yellow t-shirts. P.S. 9 supporters have on white t-shirts, some that read "I Heart P.S. 9." Created with Admarket's flickrSLiDR. Armed with two minutes and a microphone, community leaders, parents and teachers will testify on Friday about a controversial plan to open a charter middle school in Brooklyn. Parents of P.S. 9, a popular elementary school that would share space with Brooklyn East Collegiate, a charter school that opened last year, are opposed to the plan. They say there's simply not enough room for the two schools to peacefully co-exist. Administrators at Brooklyn East Collegiate, part of the Uncommon Schools charter school network, say that District 13 needs an effective middle school and that their organization has a track record that proves they're up for the challenge. They also note that the school's current location in District 17 was always meant to be temporary. City education officials approved the co-location plan in February, but the state education commissioner overturned that decision in March. The plan didn't fairly allocate gym and library space between the two schools, according to the ruling. The city Department of Education revised its plan, but can't move forward without a public hearing first. A live broadcast of the event, which begins at 6:00 p.m. EST on Friday, May 13, can be viewed below. If past hearings are an indication, the public comment period promises to be a colorful variety of testimonies. Speakers have used raps, songs and poems to get their point across to education officials.